Last week, Facebook and Instagram experienced technical difficulties. In other words, for my generation, speaking for all millennials, life as we know it was put on pause and we waited anxiously to see if our source for purpose, joy and happiness would ever return. You may or may not have been affected by the social media issues from last week, but because there are over 2 billion Facebook users around the world, a lot of people were. Facebook has such power in so many people’s lives because it connects us to one another. Through Facebook, we can see what is happening in our friends and families lives no matter where they are in the world, and even keep tabs on people we liked in the past or follow our favorite brands and celebrities. Facebook allows us to fulfill that need to be connected, but are we really connected? Facebook does allow us to connect, but are we honest about who we are on the internet? Do we add or subtract parts of who we are when we are on Facebook to get more followers? When Jesus came into the world, he wanted to reconnect with everyone, but he didn’t use the most popular way to get followers. Instead, Jesus reached his goal at the cross to gather his people. Jesus got a double rejection in this verse. Not only did the religious leaders of the Jews not want Jesus around, even the political leader wanted Jesus dead. Jesus struck a nerve with these groups because he exposed their wickedness. Jesus showed the Pharisees to be hypocrites who claimed to keep God’s laws but hadn’t. And, Herod wanted Jesus dead because Jesus reminded him of John the Baptist, killed by Herod, who called Herod out for stealing his brother’s wife among other evil things he had done. These groups wanted Jesus out of their region and especially away from Jerusalem where the Jewish temple was and where Herod’s palace was. When threatened, Jesus never said, “Yea you are right Pharisees, that Herod is a scary guy and I don’t really like confrontation, being different, betrayed, persecuted or killed, so I’ll just go do something else or take back all the things I’ve done.” No, Jesus told them to tell Herod, if he had really said something to them at all, that he was going to keep on with his goal to die in Jerusalem. I wonder how many followers Jesus would have on Facebook if it was around back then. Jesus boldly shared God’s Word with everyone, friends, enemies, Israelites, Romans, he did not change who he was, even though many people wanted him to be something he was not. It is hard to find someone both bold and on the side of truth on the internet and in the real world. We might even believe it is hard to find someone both bold and on the side of truth in churches, which has brought some to give up on church. Some believe or believe because of an experience that all churches just want to judge you and if you stick around, they will just hurt you, sounds like what the Pharisees and Herod wanted to do to Jesus. It is hard to find someone bold and on the side of truth, even at times in churches, but I bet a lot of people in Rockwall, Heath, Fate, Wylie, Forney, etc. still want to find a church. We all want to connect and what better way to connect with someone that through their faith in God. If we are looking for a church then, we need one that allows us to connect, to connect through an uplifting experience with good music, ways to make you a better person, to make friends, wait am I describing Facebook. 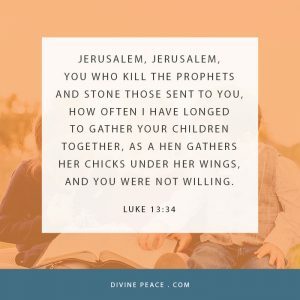 Yes, connections, music, kind people and friends are things you can find at church, but if those things are not founded on what Jesus was going to do in Jerusalem, can it really be a place filled with Jesus’ followers? The issue all people have with Jerusalem is the cross. The cross is the issue because it treated sin as it truly is, a horrible curse. Everyone is affected by that curse. Therefore, no one is Jesus’ follower because he accepts a person for who they are. Instead we are Jesus’ followers by what he did for us. The Pharisees and the people of Jerusalem rejected God’s gift. They rejected Jesus, but he would not reject the path to save them. Jesus was the one thing needed. Jesus repeated Martha’s name like he repeated Jerusalem to deliver both a call to repentance and loving assurance of forgiveness. It is like when mom used your first and middle name when you did something wrong as a kid. Mom did it to show she was serious about what you were doing wrong and serious about her hope that you would start doing what is right. Jesus wanted the people of Jerusalem and all people to repent of their sins and look to him for forgiveness. Blessed is Jesus who has come to take his children to heaven. There are 2.32 billion followers on Facebook and 7.7 billion people in the world meaning 1 out of 3 people has Facebook. I’m not sure how many were affected when Facebook was having issues, but even if it was ten percent, that would still be millions of people. Facebook may have the power to bring people together, but it can’t bring them together forever. Jesus’ goal when he came into this world was to gather people to himself, but he didn’t do it in a way that everyone ‘liked’ or wanted to ‘follow.’ Jesus’ came to save all people from sin and death by giving his life as a sacrifice on the cross to save us. Only through what Jesus has done for us are we connected to God and to life forever. May God continue to fill us with thanks that Jesus reached his goal at the cross to gather his people. Amen.